Signed the Petition against PTI yet? 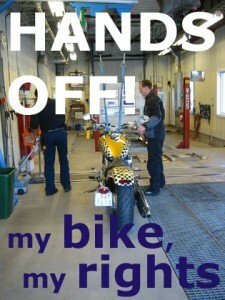 Almost 700 of you signed the petition against PTI at the RDS bike show in March. We still need as many signatures as possible, and a number of you asked for a PDF form that you could distribute. Please post completed forms back to the MAG office at the address on the bottom of the form, or alternatively drop it in to us. You may wonder why we’re not using an electronic petition, and the answer is simple. We want to show the true strength of feeling amongst the motorcycling community. A truck load of paper will have more impact than a screen full of e-mail addresses. MAG Ireland will be collating & forwarding the signatures to FEMA, where they will be combined with tens of thousands of signatures from riders rights organisations across the EU and presented to the EU Commission as a symbol of our frustration with their failure to listen, engage, or properly understand the unique attributes of motorcycling. If a thousand riders say no to roadworthiness testing, they will hear us. If ten thousand riders or more say no to roadworthiness testing, they will listen to us!